I’m not really sure what to think about this movie. It’s part real documentary and part fake documentary. Or at least that’s how it seems. And I kind of wish they would’ve stuck to one or the other. There is one thing I know for sure, though… Charlyne Yi (main character) bugs the crap out of me. 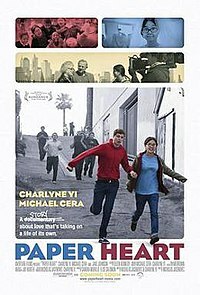 I really like Michael Cera, and thought he was pretty funny, for the most part, but I just couldn’t really get into the story, or whatever you’d want to call it. The premise is that Charlyne doesn’t believe in love, so they go around and ask people if they believe in love and why, etc, to… convince her? I dunno. There were parts during the actual interviews that were sweet/funny/etc., which was nice. Probably my favorite scene came when Charlyne began talking to some random kinds on a playground. It was quite hilarious. For the most part this is an okay movie, but with Yi at the helm, it moves more into “meh” territory. First, let me just say that I’m a fan of Jared Hess’s movies. I loved Napoleon Dynamite when I first saw it, and I loved Nacho Libre ever more. I know this puts me in a pretty small group of people, but I find the absurdness of the characters and stories quite funny. I mean, they are dumb, and I take them for what they are. 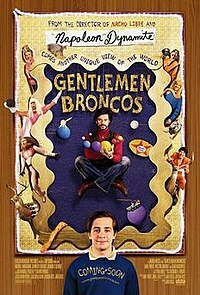 That being said, Gentlemen Broncos falls right in line with Hess’s other two movies. It’s stupid, the characters are outcasts and way behind the times (whatever time they’re in), and the jokes are either super obvious or way out there. And I’m okay with that. This movie is definitely kept afloat by Jemaine Clement as the sci-fi author Chevalier. And Sam Rockwell is hilarious as the main character of the book (and movie) within the movie. Look, if you didn’t like the other two movies mentioned, you won’t like this one. If you did, you probably will, although it’s a little more out there. My only real complaint is that there are a few jokes that just seem a little too immature and easy and could’ve been left out. For what it’s worth, I (and the MZLs) enjoyed myself. I had to knock this one out before the Oscars, just to make sure it didn’t need to win for best song. It doesn’t. It was a good movie, though. My main complaint is that it’s just really slow, but given the subject matter, I don’t know how it couldn’t be. I thought everyone did an excellent job, acting-wise. 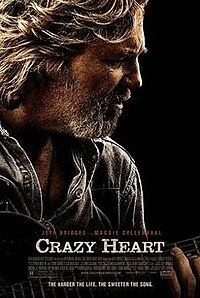 Jeff Bridges was outstanding, and Maggie Gyllenhaal was pretty great. The story is kinda like Walk the Line, but not based on real people, and a little less dysfunctional. It’s a pretty predictable plot with a few small twists and turns. Even though I don’t think the song nominated should win for best song, I do think the music was excellent (and I’m not a country fan) and a couple of the other songs in the movie were way better than the one that’s nominated. Definitely worth seeing, but didn’t blow me away. We went to the dollar theater to see this with Reid and Ashley tonight. I guess my main comment is that this is very obviously a Disney film. That’s not a bad thing, just an observation. The animation was excellent and very “classic” Disney style. The story was good, and the songs were pretty clever and fun. My favorite song was sung by Mama Odie and a bunch of birds. This movie had the scary villain that is typical of Disney movies, although I think this villain might be the scariest one yet. The story takes place in New Orleans (fitting that we watched it on Fat Tuesday), so all the bad stuff that goes on is because of some crazy voodoo. This villain mixed with all the voodoo makes for some really creepy scenes. I’m not sure this is something I’d want a young kid to see. I didn’t find the movie all that funny, either (though they tried at times), although my favorite character, a lightening bug named Raymond, was pretty darn humorous. This is definitely not anywhere close to my favorite Disney movie, but I was never bored and had a good time with it. 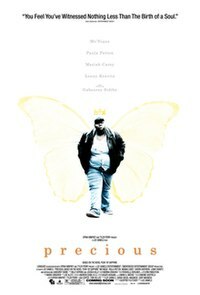 First, let me say that I almost didn’t see this movie just because the official title is “Precious: Based on the Novel ‘Push’ by Sapphire,” and that’s just dumb. I mean, really dumb. It’s going to be super annoying during the Oscars, too, when everyone has to say that full (bull crap) title every time they mention it. Hello, a huge number of movies are based on books, and no one else feels like they have to put that in the title. Oh yeah, a review… Of course, going into this movie, I knew it was going to be depressing, but I think this was maybe just too much. I’m not quite sure why this story needed to be told. Even in the end I didn’t feel like there was really a good moment. It was just like… things aren’t AS crappy as they used to be. Still crappy, though. Yes, the main character was making strides to better her life, but I still just felt sorry for her and didn’t know that she’d really make it in world. I will say that the performances were excellent, but the production of the movie itself wasn’t very good. Having seen this, I’ve now seen all ten movies nominated for best picture, and I have to say that this is my least favorite. It’s not really a movie I’d recommend. I know not all movies have to have happy endings or anything, but the stuff you have to sit through during this movie is not entertainment in the slightest. There is one girl in the movie that I guess is the comic relief (although it doesn’t help the mood), and I did think she was hilarious and laughed out loud quite a few times. But laughing at all during this movie made me feel a little awkward. I really, really enjoyed this movie. I really can’t say too much about it without giving stuff away, but it has a very cool plot with some great moments and a lot of great meaning. Also, the acting was superb by everyone. 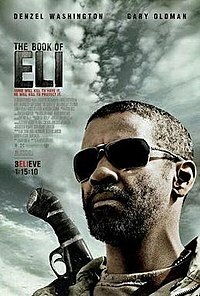 I’m pretty sure this would bump something off of my top 5 post-apocalyptic movies list, but I’d like to see it one more time to make up my mind. This is definitely one to check out. It’s not by any means perfect, but it’s a lot of fun. It’s a bit gory at times, but nothing too over-the-top. I’m actually really looking forward to seeing this one again, to look for clues on some stuff. Check it out!